It’s that time of year around our house – ski season – where the magazines start coming in and Grady starts talking a whole lot about planning our ski trip(s). It’s the time of year where Grady has skiing on his mind ALL the time. 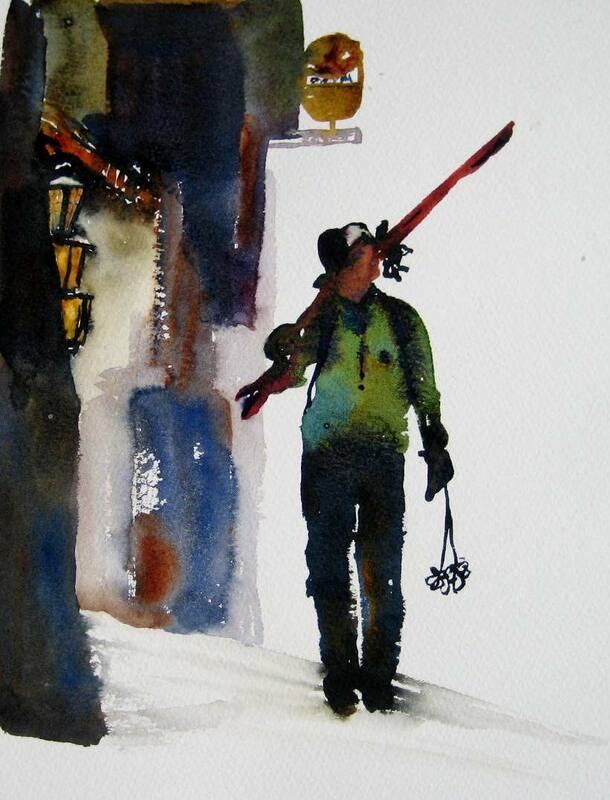 I painted this first painting from a picture I saw in one of his ski magazines – I was drawn to the skis and to the lanterns on the side of the building. 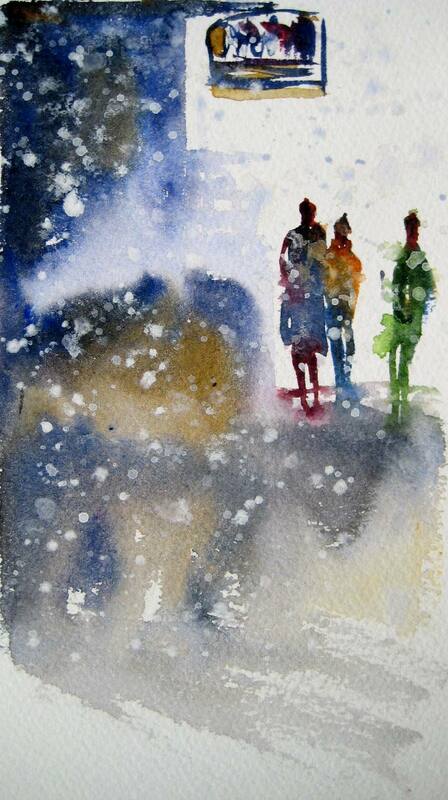 The second painting was more of a quick sketch I did – I wanted to try a snow technique in painting so I did a quick background to put the snow on top of. Grady’s watching the weather channel right now – that’s another thing that we do a lot more of when ski season is upon us – Grady starts filling me in every time it snows somewhere. We would watch the weather channel 24/7 if it was up to Grady – he LOVES it – he even refers to the people on the weather channel like they are his friends – like he knows them personally or something. There’s someone new on there tonight and he was wondering if she was a fill-in for Alexandria who is pregnant – he got all excited and said, “maybe she had her baby!”. I don’t even know who Alexandria is, much less that she’s pregnant!!! Ok, this is funny – Grady just proofed this post for me and informed me that her name is Alexandra… I spelled it wrong – oh brother!!! that is so funny….David’s mom can do that with the hosts on QVC. she knows all about their homes, their kids…so many details! your paintings are beautiful as always….incredible!! hey, i read a great verse i want to share with you. when i have a chance, i’ll send you an email with it and some interesting details!! love you, love you, love you!! Thank you Susan! I’m glad someone else out there is as weird as Grady. I’ve had other people tell me they are weather channel junkies too though. YES, send me the verse – I can’t wait to hear the details!!! Love you too friend – it was good to see you last night and catch up a little. Thank you Marge! I miss you too!! !